Our bone density tests quickly measure and help detect osteoporosis or ostopenia, which are usually caused by excess parathyroid hormones, aging, or a lack of estrogen in older females. Osteopenia and osteoporosis are diseases in which the bone’s mineral density is low, which increases the risk for fractures because the bones are thin. Osteoporosis is usually caused one by three things: excess parathyroid hormone, advanced age, and lack of estrogen in older females. If a patient fits into more than one of these categories, the risk is compounded. Osteopenia is similar, but simply refers to a lower bone mineral density (BMD) that is lower than normal but not quite low enough to classify as osteoporosis. Bone density tests are most important to menopausal women and patients with parathyroid disease. The parathyroid glands regulate calcium absorption, distribution and excretion. With hyperparthyroidism, bones release calcium constantly into the blood stream and bones lose their density. Plus, the excess calcium in the blood can cause a patient to experience a wide variety of symptoms such as not just feeling well, aches and pains, all the way to kidney stones. Often bones will ache as the process of bones releasing calcium can be painful. How does the bone density testing work? 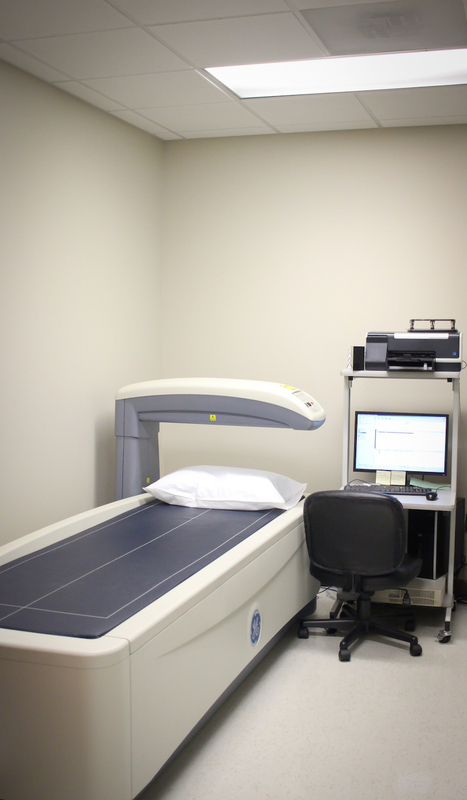 The Bone Density machine in our office provides precise measurements for total body measurements while keeping radiation at a lower dose than average when compared to other bone densitometers. Atlanta Diabetes Associates have diagnostic testing areas located conveniently within our office, so results are quickly and accurately gathered and reviewed onsite. Then as appropriate, we help you take action.